La Soñador ~: Guest Post - BOOK LAUNCH on WEDNESDAY! Guest Post - BOOK LAUNCH on WEDNESDAY! What if the Russians really are going to attack? What if WICK really happens? Fiction can serve some great purposes. It can teach us things we do not know... about history, philosophy, the culture, etc. It can teach us things we need to know too. Specifically, apocalyptic or "survival" literature can often open up our eyes to real life threats, and teach us ways to mitigate or deal with those threats. We can learn real skills... or at least we can learn about real skills... by reading fiction. It isn’t likely that you’ll ever be chased through the streets by zombies or vampires. Books are fun, and I am a big fan of fiction too. But there are very few good fiction books out there that offer a realistic and accurate scenario of a worldwide meltdown and societal collapse. The scenario we set up for our fictional apocalyptic series WICK is now jumping off of the headlines all over the world, and it’s becoming hard to ignore. My email box is filled with messages from WICK fans that are now seeing what is going on right in front of them. In addition to Russian bombers circling our strategic bases on Guam, and their nuclear subs shadowing our coasts and cruising around in the Gulf of Mexico, the old Soviet guard has reactivated Cold War era nuclear missile exercises aimed at the United States and the West. In WICK 1, the first book in the WICK quad-ilogy, we discuss the very real long-term deception strategy against the U.S.—a strategy that was reported by Soviet era defectors as far back as the early 1960’s and unveiled to the American public in great detail by defector Anatoly Golitsyn in his scarily prescient 1984 book New Lies for Old. Golitsyn and dozens of other defectors predicted that there would be a “controlled collapse” of the Soviet Union, and that Perestroika and Glasnost would be all parts of a long-term con game used to isolate, weaken, and eventually destroy America. I’ve discussed this plan on this blog many times, and I hope you have read other free materials we’ve given out about the reality behind the EMPthreat, and about the WICK series. Download and Read New Lies for Old for free. WICK 2: Charm School, the 2nd book in the fictional WICK series, describes in alarming and accurate detail a scenario on how a “super-EMP” weapon, designed by Soviet EMP specialists, built with their assistance in North Korea, could be delivered and detonated in the skies over the United States. North Korea has accused the United States of using military drills in South Korea as a launch pad for a nuclear war and has scrapped the armistice with Washington that ended hostilities in the 1950-53 Korean War. North Korea, which has one major ally, neighboring China, threatens the United States and its "puppet", South Korea, on an almost daily basis. "Since the United States is about to ignite a nuclear war, we will be exercising our right to preemptive nuclear attack against the headquarters of the aggressor in order to protect our supreme interest," the North's foreign ministry spokesman said in a statement carried by the official KCNA news agency. North Korea conducted a third nuclear test on February 12 (author's note: also the launch date of WICK 2! ), in defiance of U.N. resolutions, and declared it had achieved progress in securing a functioning atomic arsenal. It is widely believed the North does not have the capacity to deliver a nuclear strike on the mainland United States. The North's unnamed foreign ministry spokesman also said it would be entitled to take military action as of March 11 when U.S.-South Korea military drills move into a full-scale phase as it had declared the truce invalid. All the while Russia is moving nukes, re-targeting missiles, launching new and better submarines, and moving towards a war footing, America is arguing about sequestration and the government is making a case that Americans on American soil should be legitimate targets for lethal drone strikes. Americans think that their government should not be in the business of protecting them from foreign powers, or from communism, or from the very real likelihood of a foreign power sending the country back to the 1850’s, or worse… causing them to reach 18,000 degrees Fahrenheit in a tenth of a second. Americans do think that their government should be in the business of providing them a job and a living. Interesting, how far the USA has fallen, but it does highlight the fact that the Soviet’s long-term strategy has been to weaken America militarily, economically, and morally… so that Americans will embrace socialism and communism after the fall. So let us recap… shall we? * Russian defectors have told us for almost 30 years of a plan to lull America into a corrupt and decadent sleep, to allow America a quarter century as the lone superpower so that they would exhaust the treasury as well as their economic and moral power, so that the West can be destroyed in a moment, in the twinkling of an eye. * Everything that these defectors have said is going to happen, including the collapse of the former Soviet Union, has come to pass. * Russian spies are still working inside America to bring about her downfall. * We’ve reached the window of opportunity that the defectors predicted would come… and we are in the condition that they said we would be in when we got here. The WICK series has been quite a phenomenon since it was first released on December 26th of 2012. Thousands of copies of WICK 1 have been sold, and tens of thousands have been distributed all over the world. The book is consistently ranked on the top 20 Bestseller list at Amazon.com in its genre. WICK 2: Charm School was released on Kindle on the 11th of February, and it too has consistently been on the Bestseller list in its categories. The great news is that WICK 2 is now available in Paperback! Our Book Bomb for WICK 2 in Paperback is on March 13th (Wednesday) and we are asking everyone with an interest in both great fiction and this interesting story to help us. Deep in the Catskill Forest Preserve is a town that doesn't exist... at least not officially. Warwick is an authentic Russian village not far from New York City. It is also a Charm School, a spy school where Americans are trained and raised from birth to be Russians, sent to spy for America in the former Soviet Union. The problem is that this little slice of Russia is heading toward a second Russian Revolution, and the town is about to explode. In this second volume of Michael Bunker's bestselling WICK series, Michael and Chris Awalt return us to the beautiful, thrilling, and deadly town of Warwick as the world spirals into chaos and a new world war is only the flick of a switch away. As civilization comes apart after the detonation of a “super-EMP” weapon over the American northeast, and as violence and war spiral outward - enveloping the whole world, Warwick refugees wander out into the mayhem and madness to escape the life of lies they’ve left behind. They are heading for Amish country in Pennsylvania, with no idea of what they might find when they get there. WICK 3: Exodus is the setup to the upcoming final book in the series… WICK4: One Word of Truth. We are asking everyone to help us with this Dual Book Bomb. 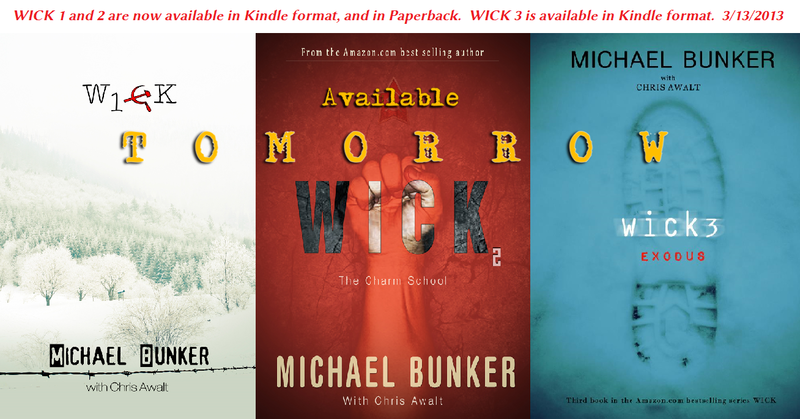 Buy WICK 2: Charm School in Paperback on March 13th, and be sure to pick up WICK 3: Exodus in e-book format at the same time. The WICK series has already accomplished many rare feats for an Indie book series, and we are excited about what is obviously happening out there – a grassroots movement of individuals supporting an independently published work, to the point that it is being represented across the board at the top of the bestseller lists that are usually reserved for books published by mainstream publishers. The biggest success story out there right now in publishing is the story of the WOOL series, by Hugh Howey. WOOL is an extraordinary read, and it has deserved all of the praise and success it has received. I highly recommend it if you like sci-fi or post-apocalyptic literature. WOOL has taken the publishing world by storm, and it started as an Indie self-published book. The WOOL Omnibus has been optioned to be made into a movie by Ridley Scott, and is a New York Times Bestselling novel, and probably best of all, you can let your children read it. So here is why WOOL’s story matters to us. WOOL was released in July of 2011, and it didn’t start to really make noise until October of 2011, four months later, when it sold 1,000 e-copies in a single month. That is extraordinary for a self-published book. WICK is about something that could actually happen. In fact, it borrows directly from today’s headlines, often as they happen. It’s not likely that any of you will be running around a silo in 200 years trying to figure out what happened. WOOL is great fiction. It is great fiction that I highly recommend. WICK is fiction that has a scary reality surrounding and under-girding it. The one thing that Hugh Howey and WOOL have had is an active, supportive, and excited fan base. The WOOLITES are incredible supporters of the book and series. I'm not looking for that kind of success, nor do I expect it. But I am a firm believer that no indie author will ever find real success without an activist fan base that believes in the project and wants it to succeed. That is what we need too. Listen, it’s pretty simple… there are a couple of reasons that you might want to get on board the WICK rocket ship. First, maybe you want to give your friends and family members a great read that will also deliver to them some very real and important information about what is going on in the world. Second, maybe you just love a good tale! The reviews for every book in the WICK series have been almost unanimously, outrageously, good. Maybe you’d just like to join someone you know on as they go on a fantastic adventure. I’d like you to come along. There are many different good ways to help bring WICK to the attention of the world. First, buy the books and buy even more to give away to friends and family members. Buying 1, 5, 10 copies of WICK 2: Charm School would go a long way towards helping us be able to afford to keep up the efforts. Second, help us get the word out. We don’t have publishers or agents doing the work for us, and we don’t have the money that other books have to help themselves get seen by more eyes. Third, join us on Facebook and help us keep the good buzz going. Tweet about it, or just use the old-fashioned Luddite way and use word-of-mouth. We need all the support and help we can get. MARCH 13th is our Book Bomb date! Bookmark this blog post. Write it down. On March 13th you can come back here and all of the links in this article will be live. You’ll be able to click on the book covers and go directly to Amazon to buy the books. If you haven't already read WICK 1, it is available in e-format for only .99! and paperback for only $8.67. Always remember that anyone can reada Kindle book even if you don't have a Kindle. You can also gift books to friends from the Amazon sale page. We want everyone to buy the book on that date, because we want the books to make another run up the Bestseller charts! The bigger the splash, the bigger the ripples. Guest Post ~ Are You Ready? Make Your Own Hummingbird Feeder - Easy! 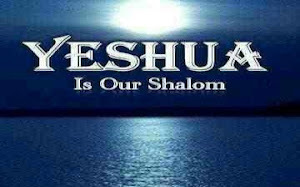 Revelation 5 - Our Passover Lamb is Worthy! "I set before you Life.... Death..."